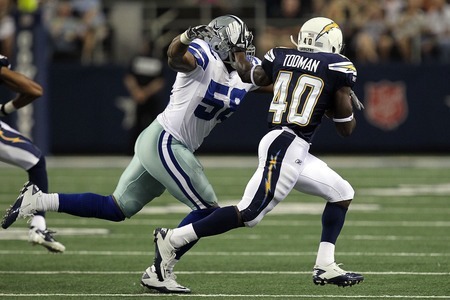 Orie Lemon had not played much on defense before Sunday against the Giants. Two plays is all, in fact. But the Cowboys didn’t suffer when Lemon had to replace Dan Connor, who went out after 10 plays with a neck strain. Lemon played 23 plays and newly signed Ernie Sims 10. "Orie did play some in the game," Cowboys coach Jason Garrett said. "Ernie Sims did play some in the game. I think those guys handled themselves well going into that situation." Lemon, who spent all of last season and two games this season on the practice squad, was activated to the 53-player roster the day before the Cowboys’ game against Tampa Bay. He has been a special teams contributor in three games but had played only two plays on defense this season until Sunday. He made three tackles against the Giants. "It was good for me to get it against a good team like the Giants, being able to go in and do what I did," Lemons said. "I have a lot to work on, but I know what I’ve got to work on." With Sean Lee out for the year with a toe injury, and Connor’s status undetermined for Sunday’s game against the undefeated Falcons, Lemon is preparing as if he will start. "I know at any moment anything can happen, so I’ve got to be mentally ready for anything," Lemon said. "I study like I’m a starter, so I make sure if I do go in there, there won’t be any drop-off."